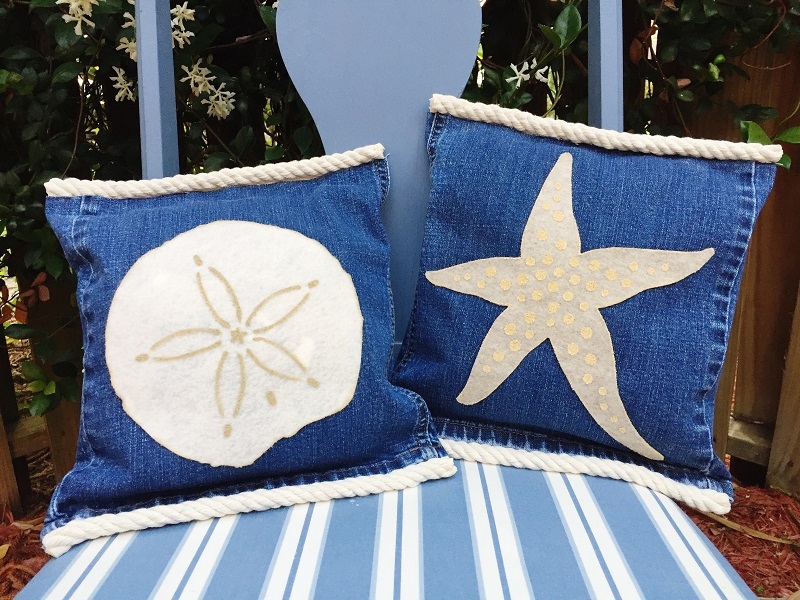 Living in Florida, I am always incorporating coastal and sea life themes into my home décor pieces AND I love to upcycle items like old blue jeans, so this tutorial how to make starfish and sand dollar denim pillows is a project that is perfectly “ME”! 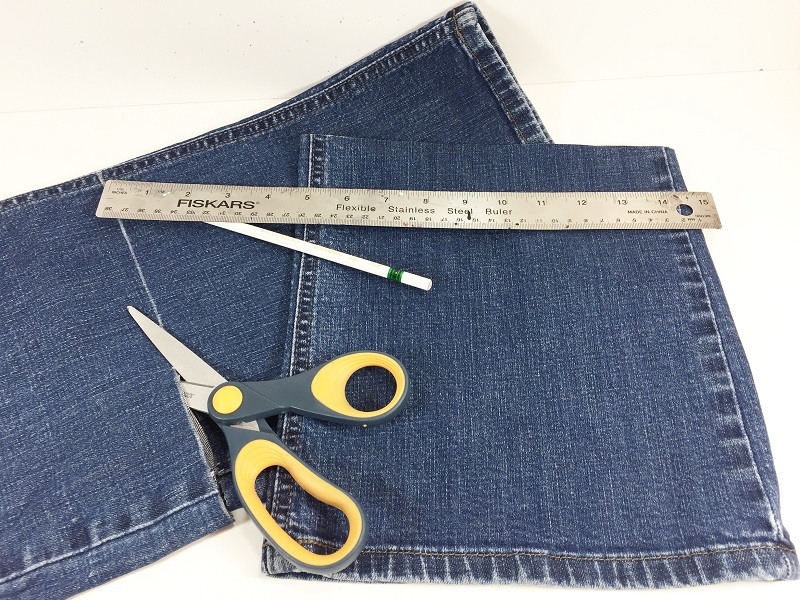 Measure the width of the bottom of the legs of your blue jeans with a ruler. I used old boot cut jeans, so they are 9” wide. Measure up 10” from the hem and mark with Aquarelleable White Pencil. Cut with scissors. Measure and cut four lengths of natural rope trim to the width of your jeans (mine are 9”) and set aside. TIP: Secure ends of rope trim with liquid glue to prevent fraying. 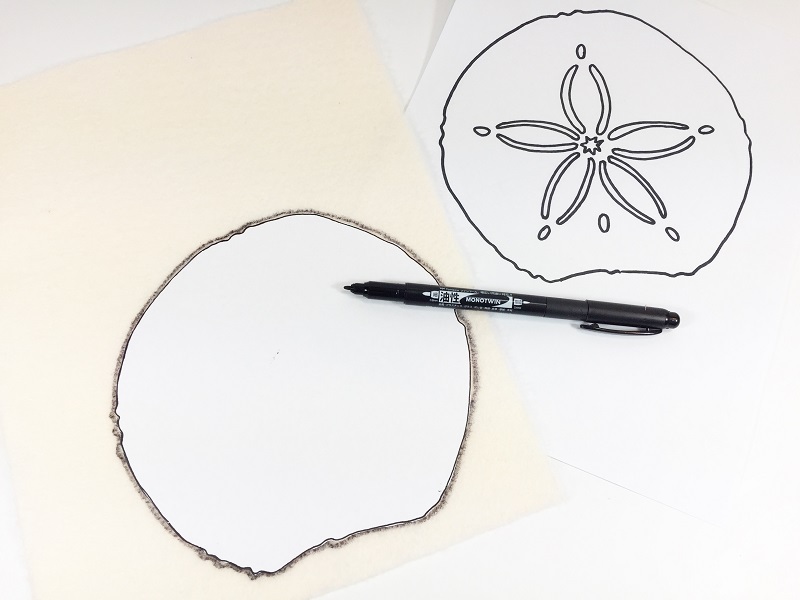 Download, print and cut out Starfish and Sand Dollar patterns HERE or draw your own coastal themed images. 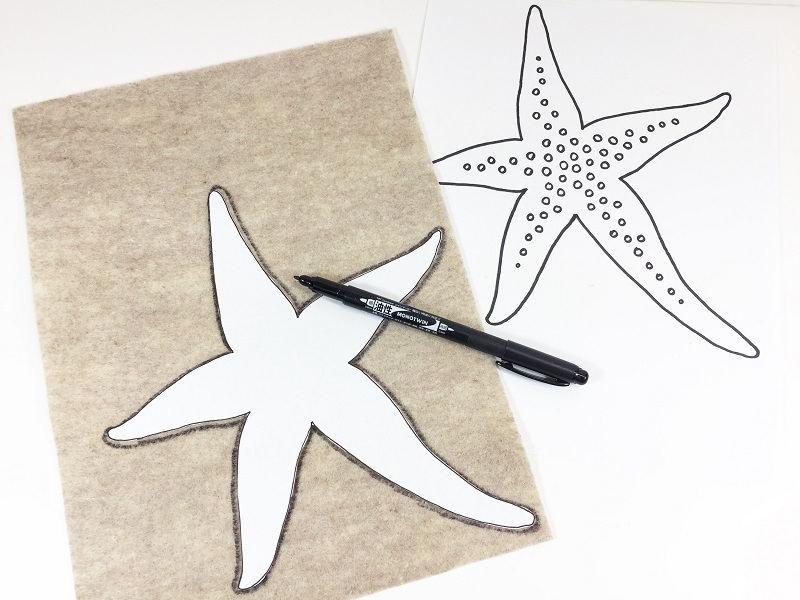 Trace Starfish onto Kunin Eco-fi® Classicfelt™ Sandstone and Sand Dollar on to Kunin Eco-fi® Classicfelt™ Cream with a permanent marker. 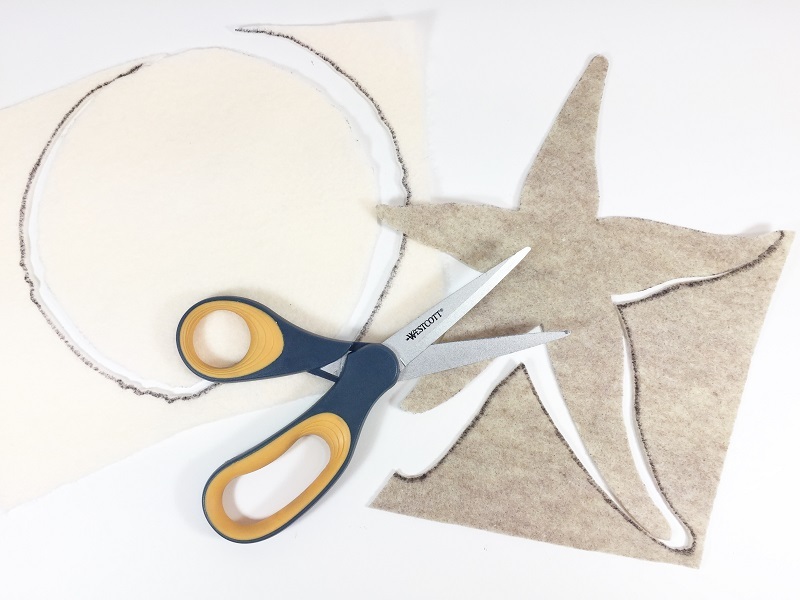 Cut out images with scissors. 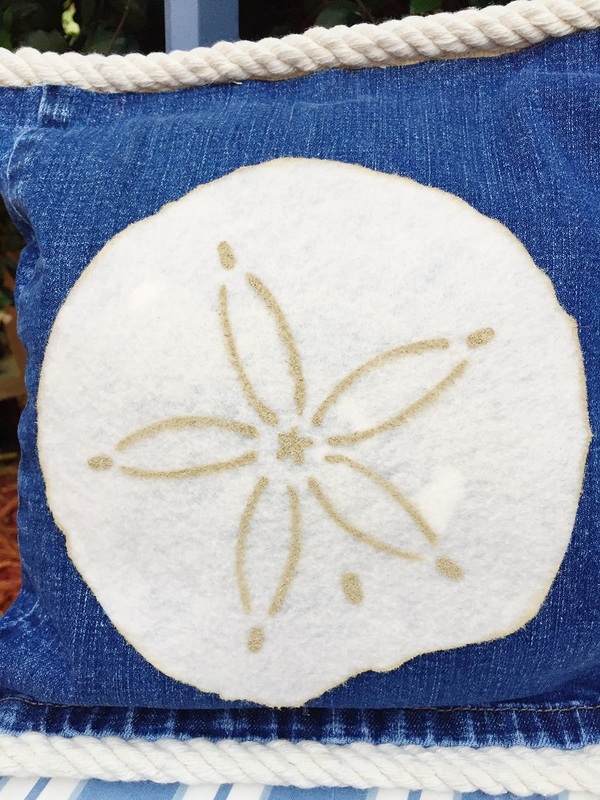 TIP: When using a maker to measure on to felt, cut inside the lines so you end up with a clean finished product. 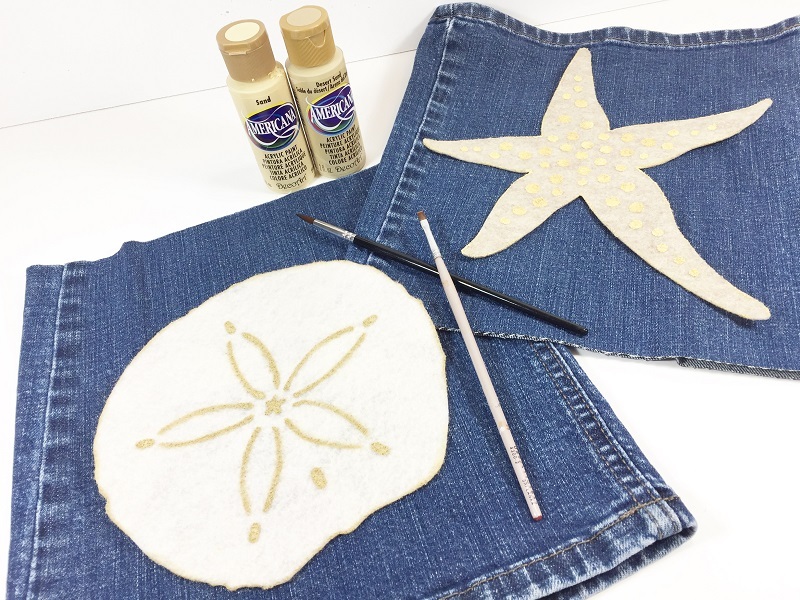 Using patterns as your guide, paint on details using Sandstone colored paint on Sand Dollar and Sand colored paint on Starfish. Outline the edges with paint to make your images really POP! TIP: To create perfect dots, simply dip the eraser end of a pencil and/or handle end of a paintbrush in paint and pounce onto the surface. 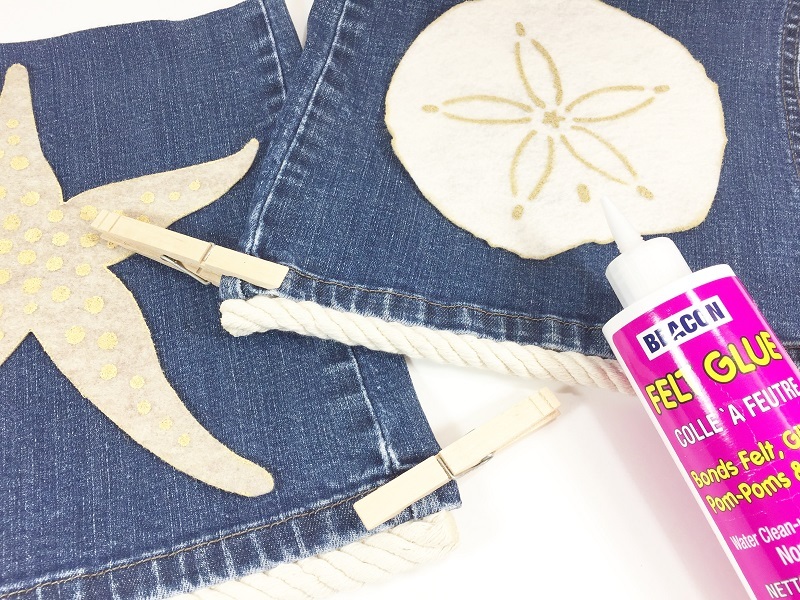 Apply Felt Glue to the INSIDE top and bottom edges of the blue jeans hem. Carefully insert the natural rope trim. Push down gently to make sure that the glue is grabbing the fabrics, then secure thicker edges with clothespins until dry. Fill both pillows with polyester fiber fill. 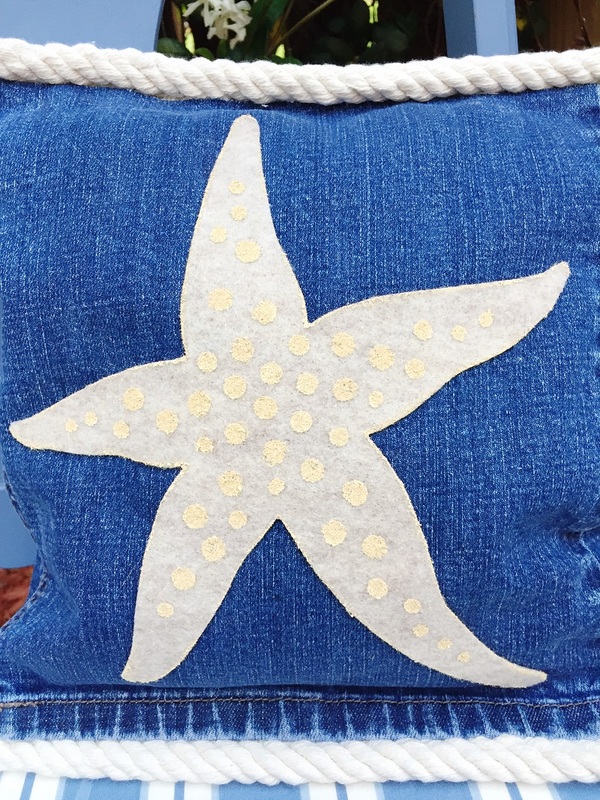 Apply Felt Glue to the INSIDE top and bottom edges of the blue jeans hem. Carefully insert the natural rope trim. Push down gently to make sure that the glue is grabbing the fabrics, then secure thicker edges with clothespins until dry. Here is a detailed shot of the painted felt images – LOVE! I am exited to share some other projects made by myself and some of my favorite people. Hop over to check out their darling ideas using Fairfield World and Kunin Felt products! We have a contest for you to win a $50 gift card to Starbucks and a bunny craft kit too. Be sure to enter! These pillows were also quick and easy to make in just an evening. 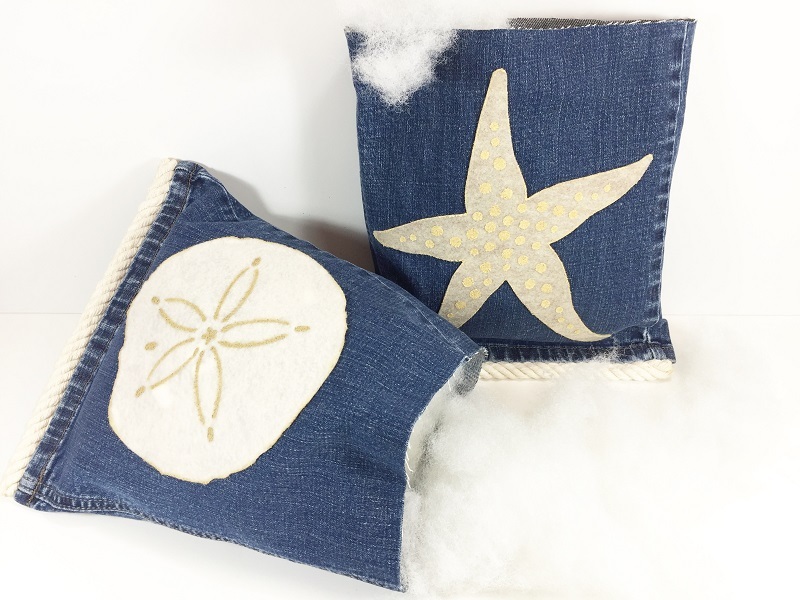 Switch up the colors, sizes and shapes to place your own personalized creative spin on this Starfish and Sand Dollar Denim Pillow project – the possibilities are endless! And Mother’s Day is right around the corner!